Nyd en tur langs den maleriske Amalfikysten med denne rundtur udflugt fra Sorrento. Besøg smukke Positano-stranden, derefter Amalfi og Ravello. This trip did not do what it says in the blurb. It did not stop at Positano Beach. It stopped outside Positano and we had to walk in. It was supposed to be a scenic drive but we only stopped once for photos and that was on the way back, although we were taken into a ceramics outlet which nobody really was too bothered about. Lots of people had written positively about a short boat trip from Amalfi costing about 12E, our driver never mentioned anything about it and then when I asked him he charged all of us 20E each, to do a short 30-40 minute boat ride. Dissatisfied with this trip, totally overcharged for what it was. Better to catch the bus for 10 E from Sorrento station and do your own thing or pick a different trip. What a brilliant day! Our guide and driver for the day was Nando. Not only fluent in English but a great sense of humour and extensive knowledge of the area we were visiting. Although the normal number in the group would be around eight, there were only four of us and Nando on our trip. The minibus was luxury and bearing in mind the outside temperature of circa 33 degrees, the air conditioning was most welcome. We've never been on roads like that. To say they twist and turn is an understatement. You'll see the most incredible views and the most wonderful towns. We would recommend this tour to anyone. A nice small group in a mini bus. Enough time allowed in Positano, Almalfi and Ravello. Although the driver pointed out some attractions along the way, we were expecting more of a guided commentary giving a lot more detail. Considering the price we paid 61.63 each not value for money in this instance. We could have just paid a taxi to do same trip or got the bus. We had a beautiful lunch, saw spectacular views. However there were 6 of us and our driver Salvatore. There was little narration of the history of the areas we were traveling through. We were in the last row of the van, the guide did not have a microphone and what little information was presented could not be heard by us. It was a long day that could have been improved with more information and better presentation. Pick- up was just down the street from our hotel and very convenient. Breathtaking views, good tour and we were all able to have a seaside view since this trip, out and return, is done on the coast road. The driver was superb, the guide was also good and the time in Positano and Amalfi was adequate. We highly recommend the quick boat trip up and down the coast. We were a bit lost when left to our own in Ravello should have brought our Garmin and we did not find the Villa Rufolo, so that was naturally a disappointment. We were told we were going to have a taxi so we could stop along the way for views, instead they picked us up in a larger van, therefore no stops along the way because there isn't enough room. 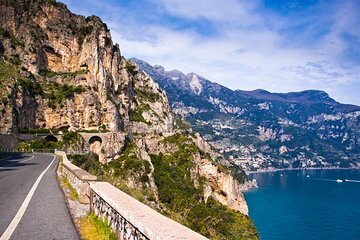 Of course, it's hard to make the Amalfi Coast anything but spectacular! It was very scenic and the driver and guide were fantastic. Had one hour in each town, which was enough to look around. Not enough for full shopping but enough to buy a souvenir. The Amalfi coast. What can I say that hasn't been said before - stunning! I was not sure whether to book a private driver or a bus tour but so glad we went by bus. Only 12 on our bus and Maria was a fabulous guide, so knowlegeable and friendly. Pay extra for the boat ride in Amalfi. So worth it! The drive was spectacular and the Amalfi coast is stunning. We stopped in Positano, Amalfi, and Ravello. Lots of walking up and hills and stairs. Unfortunately the weather was not good enough to take the scenic boat ride in Amalfi to the Emerald grotto. Guide was nice but had a little trouble with English. It felt like the stops in the towns were geared for shopping as opposed to site seeing. There is a lot of history there and I would have enjoyed hearing more about that. All in all a lovely day.